And so we reach the end of the year and the obligatory retrospective edition. 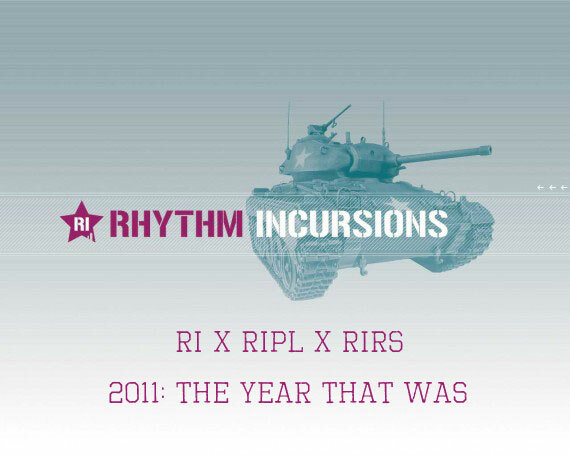 This year we’ve opted for a slightly different format, bringing together our three regular shows – RIPL, RIRS and Rhythm Incursions – into one bumper 3h edition that looks back at our favourite music from 2011. With each of us selecting one hour of music, this end of year show features primarily music and tracks which we’ve previously aired as well as a few additions culled from releases and/or artists we’ve supported this year. We start with the Rhythm Incursions mix presented by Laurent which features a mini feature on the label of the year which is Keysound Recordings, the London label headed by Blackdown. Despite having had a fairly quiet year in comparison to other labels, Keysound’s put out three outstanding albums from Damu, LV & Joshua Idehen and Sully, as well as a handful of 12″s that have all been featured on previous shows and been staples of many sets. As the adage goes quality not quantity and while it’s true that this has actually been a busy year for the label we feel that they really deserve the accolade. Alongside Keysound, the mix features regulars from the past year as well as our favourite releases including Om Unit, Shabazz Palaces, Slugabed, EAN, Kode 9, Yosi Horikawa (with his track from the Nihon Kizuna compilation), NastyNasty, Mark Pritchard under both his solo and Africa Hitech aliases, Machinedrum, Sepalcure and 1000Names. Primus Luta meanwhile also showcases his favourites – many recognisable from his own 2011 shows – in his mix. A straight up one hour mix with no talking it features some of this year’s best releases from both the electronic and rap world with the likes of 2562, Busdriver, Kendrick Lamar, Blk.Adonis, Welder, Shigeto, Lorn, Siriusmo, Madlib and Dibiase, DRC Music alongside Om Unit, Sepalcure and Sully who all make additional appearances. And as for Raid System they opted to do another top 20 countdown of their favourite tracks of the year, though this time it isn’t live. Their mix starts with a short run down of our Nihon Kizuna release as well as Broken Haze’s joint EP with B.Bravo before getting into their top 20 for the year featuring many of the artists and labels they’ve been supporting including Joker, Nino, Rustie, Hudson Mohawke, Funkystepz, Zdot, Bobby Tank, Toddska, Starkey, Daniel Haaksman, Knight Riderz, S-Type, Munchi and more. So there you have it, 2011 the year that was. As always a big thank you to all our listeners and fans, all the labels and artists and a special thanks to everyone who has kindly donated via the Nihon Kizuna compilation we put together while in Japan in March this year. We’ll see you in 2012 with the first show of the year our new BLN.FM syndication, the first of which is curated by Raid System. It will air live on the first tuesday of each month before being podcasted both here and on the BLN.FM site. Before that though there’s one more guest mix, part of our Friends of Friends mix series dropping on New Year’s Eve – it’s a surprise one so be sure not to miss. You can download and/or stream the show below or simply subscribe to our RSS/iTunes feeds to get every show automatically to your computer. This entry was posted on Wednesday, December 28th, 2011 at 1:35 am. It is filed under Podcasts, Presented by Laurent, Presented by Primus Luta, Presented by Raid System and tagged with Samiyam, 2562, Madlib, Joker, Rustie, Lorn, Trim, Jneiro Jarel, Om Unit, Hudson Mohawke, Busdriver, Dibiase, Mark Pritchard, Goth Trad, Blue Daisy, Helixir, Slugabed, Machinedrum, LV, 1000names, Kuedo, Shigeto, Yosi Horikawa, Sepalcure, EAN, Baobinga, Virus Syndicate, Africa Hitech, Knight Riderz, Schlachthofbronx, Eligh, Shabazz Palaces, Andreya Triana, S-Type, Siriusmo, Com Truise, Daniel Haaksman, Nicolas Jaar, Toddska, Phillip D Kick, Damu, Nino, Blawan, Blk.Adonis, Jonwayne, Mo Kolours, NastyNasty, Zdot, Klic, Joshua Idehen, Opiuo, Kromestar, Munchi, Sully, Bobby Tank, Danny Brown, Raffertie, Krampfhaft, The Phantom, Freddie Gibbs, Welder, The Black Dog, DRC Music, Drums of Death, Kavsrave, Taz, Small Professor, Adrian Younge, Kendrick Lamar, Kode 9 & The Spaceape. You can follow any responses to this entry through the RSS 2.0 feed.